I’m not really sure what possessed me to make this Horn of Plenty Thanksgiving Cake. 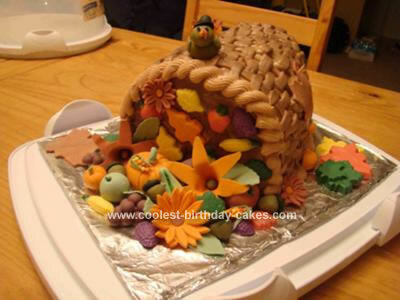 I wanted to make a cake for our Thanksgiving dinner and the only thing I could think of (other than a Turkey of course) was a Cornucopia. So I decided to try out my gum paste skills. The cake is 3 layers of a homemade pumpkin cake recipe. This is just a basic white cake recipe with a bit more sugar and pumpkin pie filling (shhhh I used canned stuff). It really turned out great and cooked nice and light (surprisingly). The icing is also a homemade cream cheese icing that I found online and it is absolutely delicious. The cream cheese icing kept melting on my while I was trying to do the basket weaving so I had to keep putting it back in the fridge. I guess my hands are too hot. The fruits and flowers and leaves took quite a few hours of preparation, and entire Friday evening actually, but it was fun and in the end it turned out great!! The cake was huge and thank God my family all took some home or we would have wasted quite a bit. Not sure I’ll take it on again next year, maybe on a smaller scale but it did make a great centerpiece! What pan did you use for your cake? And how did you assemble it? It looks gorgeous!